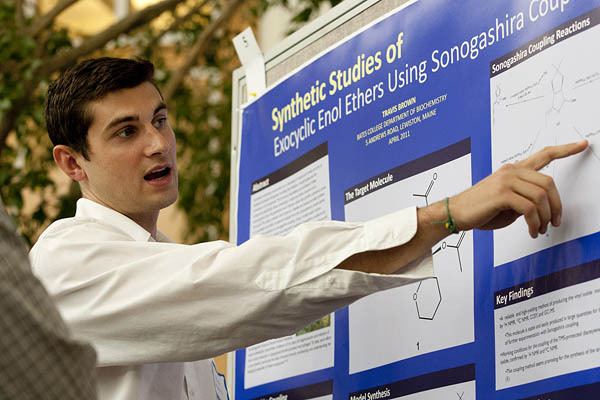 Travis Brown ’11 of East Greenwich, R.I., explains his chemistry poster, “The Synthesis of Exocyclic Enol Ethers Using Sonogashira Couling,” at the 2011 Mount David Summit. Photograph by Phyllis Graber Jensen/Bates College. The 12th Mount David Summit, Bates College’s annual celebration of student academic achievement, begins at 1:30 p.m. Friday, March 29, in Pettengill Hall, 4 Andrews Road (Alumni Walk). Summit attractions include poster presentations in all manner of disciplines; theme-driven panel discussions; films, readings and a short play; and an off-campus study photography exhibition. The Mount David Summit is free and open to the public. For more information see the website or contact Kerry O’Brien (kobrien@bates.edu or 753-6952). Performances by the Bates College Choir (8 p.m., Olin Arts Center, 75 Russell St.; free) and the Bates Dance Company (7:30 p.m., Schaeffer Theatre, 305 College St.; $6 / $3) extend the excitement into the evening. Launched in 2002, the summit has become a premier occasion in the Bates calendar. That first summit featured the work of 50 students and more 400 will participate in this year’s summit. Students who have held museum internships at the Bates Museum of Art and other museums will discuss their work. The Bates Dance Company concert features the work of student choreographers in collaboration with student lighting designers. The College Choir program comprises two masterworks, Fauré’s Requiem and Lauridsen’s Lux Aeterna.